I’ll talk with Jason Erb of fauxcapitalist.com… and delve into 9/11. We may also dabble in the AIDS hoax. This entry was posted in 9/11, Fakeologist Show, Radio on September 12, 2013 by ab. We had Rollo, Markus, and Videre on the call. Due to internet problems, the call was run through the cellular network, which meant frequent cut-offs. Sorry for the technical issues. This is like Christmas week for fakeologists, so we’ll talk about our holy-mackerel day, 9/11, Patriot Day, Wake Up a Friend day, etc. via Flight 175 (rare video) – YouTube. This entry was posted in 9/11, Recommendations, Video on September 12, 2013 by ab. 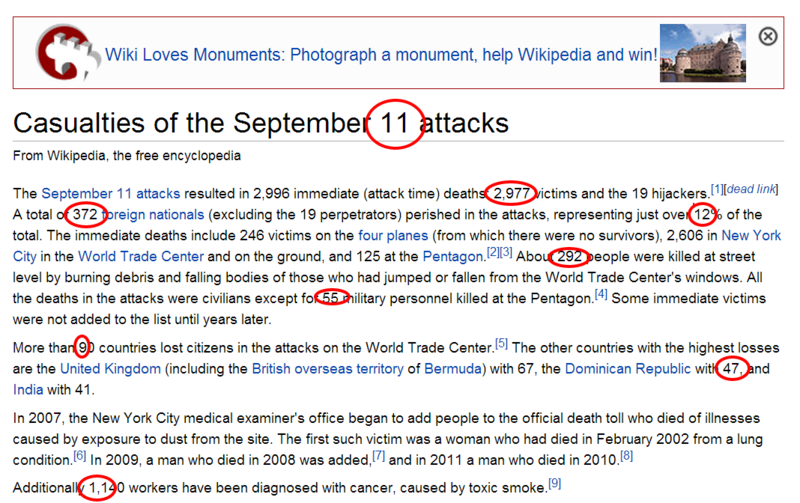 While the numbers were (and continue to be) all over the place with the 9/11 final death count, it appears wikedpedia has settled on some fairly occult numbers. It says that 2977 died. Other sites like NIST have different numbers, so confusion and obfuscation are clearly being used to this day. Casualties of the September 11 attacks – Wikipedia, the free encyclopedia. NIST reports that WTC 1 and 2 fell in 11 and 9 seconds respectively, while I’ve heard WTC 7 fell in 7. The WTC 7 wikedpedia page is chock-a-block full of occultic numbers, too many to bother highlighting. All the collapse footage is clearly fabricated in a Hollywool-like studio, if not Hollywool itself. We can never know the real times of the controlled demolition of the entire 9 building structure. This entry was posted in 9/11, Magic numbers on September 12, 2013 by ab.